Count Duckula 2 (full title: Count Duckula 2 Featuring Tremendous Terence) is a platform game that was developed up by The Conversion Company for Alternative Software in 1992; it features the characters from the now-axed Cosgrove-Hall, Carlos Alfonso Studios and Thames Television series of the same name and was released around the time they made their final appearances in Bunglers in Crime. 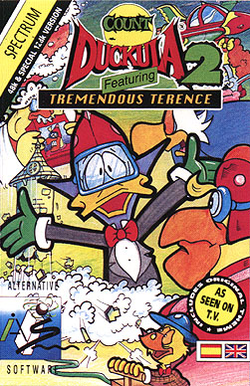 However, it is one of the most maligned games ever made (along with all other Alternative Software licensed games, with the possible exception of 'Allo 'Allo Cartoon Fun), and the readers of Your Sinclair magazine voted the ZX version the "Number One Worst Speccy Game Of All Time" in 1993 - for poor graphics, unresponsive controls, and bad hit detection render it virtually unplayable. Count Duckula did not appear in another game until the release of Power of Mouse for iOS in 2016 (he also starred in Scary Room, but Pillow Fight featured Danger Mouse's Stiletto Mafioso instead). This is from the back of the cassette's, or disk's in the case of the Commodore Amiga version, inlay card, the front of which is shown in the image to the right; it reveals that the storyline is very loosely based upon the show's fourteenth episode, "The Vampire Strikes Back", only with a few alterations. Originally, Dr. Von Goosewing blew up the turret that Duckula and his servants were inside (known as the "lumber room") to blast it off into space - and after an encounter with a pair of aliens named Trevor and Neville (known as the "Oids"), Tremendous Terence saved them, before lowering their turret down to Planet Cute, which was inhabited by two bears (one of whom was called "Adorable Amy") and a group of rabbits known as the "Cute bunnies" (the turret also automatically returned back to Transylvania at the end of the episode and crashed through the rest of the castle's roof). This page was last edited on 14 September 2018, at 17:00.